So…South Carolina is under attack. Snow flurries and ice are everywhere. Please send help because we are not equipped for this! Haha! I’m snowed in, the governor has declared a “state of emergency”, it’s leg day (which is my fave by the way) and folks across the state are losing power. Naturally, I decided to whip out my laptop to blog before my electricity goes out because…priorities. Ha! To all my SITS Girls out there, I may be a little behind in visiting y’all due to weather but I’m coming for ya! This crazy weather got me in a hotel room and who knows when I'm going home because trees and power lines are down everywhere. Be safe ad stay warm. LOL! I so get this! I moved to Idaho from Arizona, so I feel the same way every time it snows here! Luckily, we don't get hit too hard where I live in Idaho, so it's mostly tolerable. I can only say that after having lived here 3 years though. Thanks for sharing, I love your blog! Such creativity! Adding you to my Bloglovin feed! Stopping by from #SITSBlogging. That sounds like a fantastic way to spend the day! Oh no! I saw that your area got hit pretty hard. I'm praying for you and the babies! Thank you! At first people are so excited and then reality sets in for us. I've seen Idaho snow (via the internet) I would freak out. Ha! You are so cute. I lived in snow for five years (now live in northern cal), but that's pretty how much how I feel about snow too! hahhahaa. 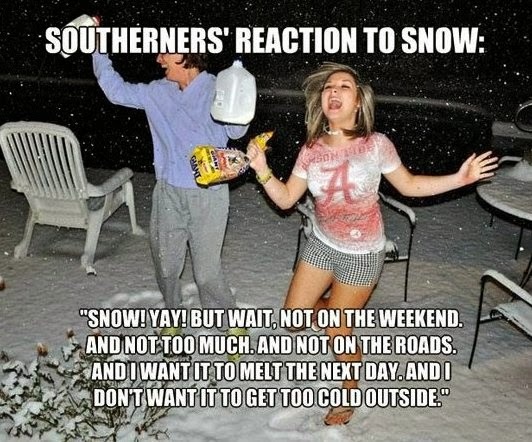 Snow in the south is hilarious. I'm in South West NC and people here lost their minds. The good news: it'll be 70 by Thursday. The bad news: there was an earthquake last night. WHAT?! You are hilarious! We're up here in Utah and we're wondering where our winter is going (it's raining and melting our 6+ feet of snow away). But, now I know where it went… down to you! Stay warm! Haha, that pic could totally apply for Seattle. It snows so rarely here, that when it does people tend to go a little cra-cray. We don't want it on weekends and not too much..and the list goes on. Thanks for stopping by #SITS girls. Five years?! You are very brave…seriously! LOL! I wouldn't know what to do with myself. Girl, I'm sending your weather back! Haha! I love my sunshine and flip flops. It was ridiculous! Haha! I just wanted milk for the baby and some rice cakes. The rice cakes were sold out. LOL!